Let talk more about the cover. There's a variant cover out there for all you Ethan Van Sciver fans. Most of you may remember him as the co-creator for Sinestro's new more evil look, and the flashing strobe effect of the Green Lanterns logos which are pretty cool if I do say so myself. This variant issue is a picture of Superman with a really cheesy look on his face breaking chains off of himself. 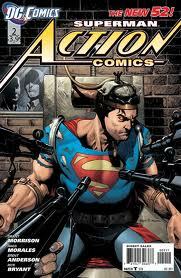 I'm not sure, but I'm assuming the issue may be some sort of homage to an earlier Action Comics cover. It is not the best artwork I have seen from Van Sciver, but that's just me. There is also a variant issue of Rag's pencils inked, which for all of you aspiring colorists, is a great piece to scan in, and get to work on. If you read issue #1 then you know that this Superman is new to the superhero business. He is seen bleeding in what I still consider the worst railway save in comic history, and is unable to fly. But hang tight superhero maniacs, this issue is about to kick into overdrive. Superman has been captured. Lex Luthor is torturing him in an effort to gauge his powers and to find any weakness he would be able to exploit. I'm not sure I like where this Lex Luther is going. It seems Grant Morrison wants us all to know that Lex is an amazing geneticist and scientist. Not the smart, corporate savvy egomaniac we are all accustomed too. I think I like the latter better than the former, but we shall see. In this charade of imprisonment we discover Superman has some form of invulnerability because a scientist breaks a drill bit on him while trying to take a skin sample. We also learn that he has an incredible amount of resistance to electrical current, and his hair cannot be cut. Making a brief appearance is John Henry Irons. Irons storms in during Lex's investigation where we find Lex referencing Irons “Steel Soldier” program to be obsolete but mentions “augmented humans.” Is this a reference to the “everyman” project from 52? Have I abused my right to use quotations? Let’s move on to the cape which is the bane of my existence. I said in my review of Action Comics #1 how much I hated this cape. Now I have even more reason to hate it. Apparently his cape is bulletproof as well as fireproof because it's Kyrptonian. I'm having involuntary spasms about this because why in the hell would his cape be bulletproof. Please don't tell me it's because of a yellow sun. After a very odd reference to a six-legged goat we find ourselves top side where Lois Lane has used her debunking skills and knows that Superman is being held at this “undisclosed” location, demanding to see her father, General Lane. Seriously?! This guy has super speed, x-ray vision, invulnerability, and he's going to play this neck snapping card? Anyway, he retrieves his cape and in the process discovers the ship that brought him to Earth. This clearly takes him off guard, then his ship begins to speak to him, saying what we know is his name Kal-El, his father Jor-El, and his mother Lor-El, and some other El's and La Va do de do's. Once he analyzes what is happening he tells the ship to protect itself because he'll come back for it. Do I need to reference his super strength again? For the sake of humanity, I will continue. Superman escapes, and we are left to wonder where he's going. My guess is to find Sportsmaster, but that's a whole new revelation I just don't have the time to get into. We find ourselves towards the end and Lex is on the phone with someone. We find out that Lex is talking to someone who has specific intelligence on Superman. Lex asks the question, “What are you?” and we pan out to the image of a spacecraft orbiting the moon, with odd tentacles. My first impulse was Brainiac. The ship is too small to be Mongul and Warworld, Darksied is coming in JLA, and this better not be Zod. Over all, I have to give it a 3.5 out of 5. I really did have to take off my seasoned Superman glasses and take this comic on the adventure that Grant is trying to take us on. I thought it was a good read, it did a nice job of explaining what Superman has in the scope of his powers, and I'd really like to see what the heck the six-legged goat was all about. But let us be honest. DC is saying this is not a reboot, but we all know it is, so if you take this issue with that in mind, it goes together really well. Bret Kinsey is a contributing writer to Champion City Comics, in his spare time he masquerades as a giraffe.